Susie James produces watercolour, pastel and acrylic paintings and her art work has been exhibited at Southampton Art Gallery and various exhibitions in the South. Working in contemporary abstract/semi-abstract styles , she enjoys painting in vibrant colours ; pushing the boundaries of the medium. 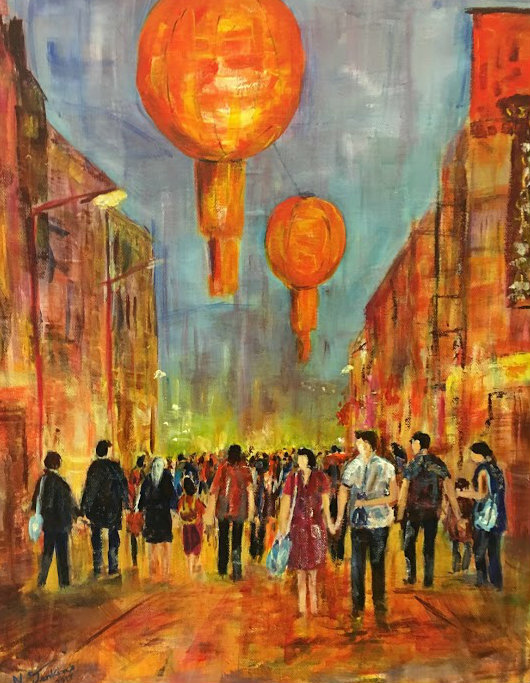 Susie likes to depict scenes and impressions from different parts of the world especially the Far East where she has widely travelled. Her aim is to evoke an emotional response to her work and she particularly enjoys using textural paint ; although painting in inks has been a recent development to her art as she feels that this can bring a different mood to a piece .